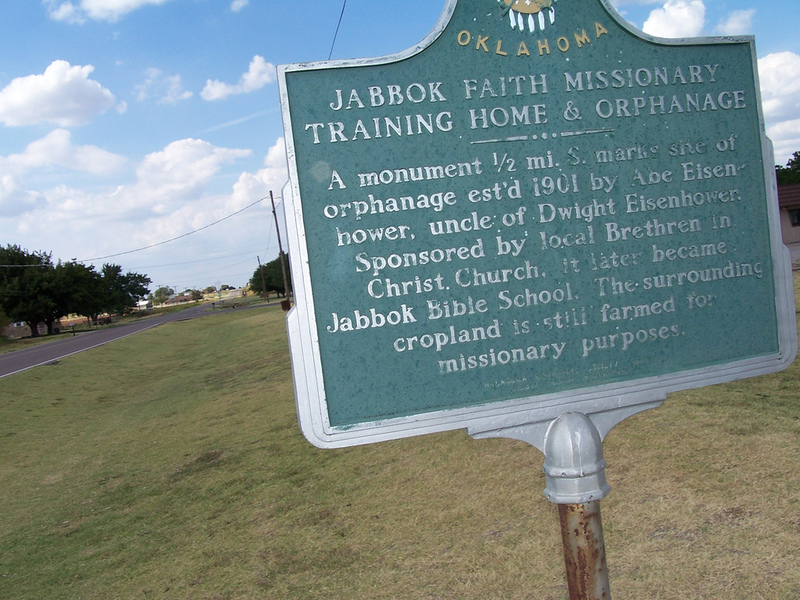 Today’s Photo Friday installment highlights an historical marker in Thomas, Oklahoma, situated just a few miles south of the former site of the Jabbok Faith Orphanage and Missionary Training Home, a institution operated by the Brethren in Christ in the early part of the twentieth century. Granted a permit by the territory, the Eisenhowers operated Jabbok Faith Orphanage and Missionary Training Home until 1909, when transfer of ownership was shifted to the General Conference of the Brethren in Christ Church. Approximately 305 students from 15 states attended Jabbok. Many of the graduates and students served as missionaries, church administrators, pastors, Sunday school teachers, church board members and Christian lay workers. Interestingly, the site also indicates that “Since the closing of Jabbok, the members of the Thomas Brethren in Christ congregation have cultivated the land. [The] proceeds go the mission program of the church at large.” I wonder if the church has continued this program since BlogOklahoma.us wrote their brief history in 2006. For more pictures of the historical marker and the monument mentioned on the marker, visit BlogOklahoma.us. For more information on the history of Jabbok, see Carlton O. Wittlinger, Quest for Piety and Obedience (Nappanee, Ind. : Evangel Press, 1978), p. 270, 306-308. This is great to see this post because I wrote a paper on Jabbok for a class of Dr. Sider’s; I think it was Historical Writing or something like that. It wasn’t one of my better papers, though! I’ll dig through my stuff, reread it and decide if it would be fun to pass along to you! Doneen: I hope you determine it to be “good enough,” because I’d love to read it.